Master of Ceremonies Dr. Scott Zeller introduced three speakers at a crowded town hall meeting March 28 sponsored by Orinda Watch to present information about the controversial CASA Compact and California Senate Bill 50. The speakers - Zelda Bronstein, a freelance journalist and a former chair of the Berkeley Planning Commission; Susan Kirsch, the founder of Livable California; and Dennis Richards, a former Salesforce vice president and a member of the San Francisco Planning Commission who offered his comments as an individual, not as a San Francisco city official - and most public commenters were vehemently opposed to both, with the general feeling that the state of California was taking over housing issues for the nine-county Bay Area. CASA stands for the Committee to House the Bay Area and is a project of the Metropolitan Transportation Commission (MTC), which is the regional organization that channels federal transportation dollars to the Bay Area, said Bronstein. MTC administers more than $2 billion annually for the Bay Area's surface transportation network, including more than $600 million in bridge tolls. The Association of Bay Area Governments (ABAG) is the regional land use planning agency, she explained. According to Bronstein, a 2008 state law forced ABAG and the MTC to collaborate on regional planning, and partly as a result, she added, "in 2016 the MTC engineered a hostile takeover of ABAG." She explained, "MTC intended to be a one-stop transportation and land use planning agency for the Bay Area." Bronstein holds that "CASA was secretly convened in June 2017 by Steve Heminger, the recently departed ex-Director of MTC." 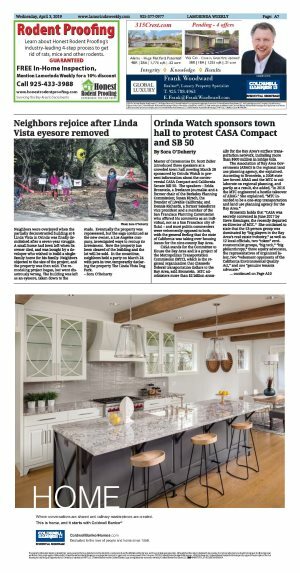 She continued to state that the 53-person group was dominated by "big players in the Bay Area's real estate industry," as well as 12 local officials, two "token" environmentalist groups, "big tech," "big philanthropy," three equity advocates, the representatives of organized labor, two "vehement opponents of the California Environmental Quality Act," and one "genuine tenants advocate." Zeller said that the state is using a "sledge hammer approach where maybe a tweezer would do. Local control," he noted, "is really at risk." Bronstein described the MTC as "rich, powerful, and feared." She gave a rapid-fire presentation filled with facts about the CASA Compact and Assembly Bill 1487, which focuses on housing development financing, but spoke so fast that a member of the audience pleaded with her to slow down. She responded that she couldn't because she had so much information to impart, although she did say that she would try. Bronstein calls the resulting CASA Compact a coup because it was an ad hoc with no legal authority with access to large amounts of public funding to formulate major policies for the state legislature. She says that the CASA Compact assumes that selfish homeowners don't want new housing, that cities refuse to build housing, that onerous laws including local zoning and CEQA have strangled new housing production, and that the Bay Area must ceaselessly grow, "whatever the cost." Her proffered solution to the housing crisis is to stop approving new tech offices in the Bay Area. Bronstein also spoke about AB 1487, which proposes to create a new, independent regional governmental agency, The Housing Alliance for the Bay Area, with authority to levy taxes, issue debt, and buy and sell land for housing development, and ACA-1, a California Constitutional amendment that would, among other things, lower the voter threshold from 66 percent to 55 percent to approve local general obligation bonds and special taxes for affordable housing and public infrastructure projects. Kirsch talked about meetings with legislators with the goals of education, information and advocacy, while Richards gave a PowerPoint presentation that focused on the specific effects of the proposed legislation. Richards described the CASA Compact and SB 50 as a "classic top-down, autocratic, Soviet-style plan . developed in backrooms." He warned that Orinda is particularly vulnerable because it is classified as a "jobs rich" community since the median income in the city is twice the state's median income. Under the proposed legislation, he claims that the building density of Orinda could potentially triple and that all of Orinda would be affected, not just the areas near the BART station. Attendees of the town hall were provided with form letters to send to their state senators asking them to "please kill the CASA Compact's SB 50 and related bills." During the meeting, Orinda City Council Member Amy Worth garnered some harsh criticism. Worth, an MTC commissioner, came to the podium to explain her positions. 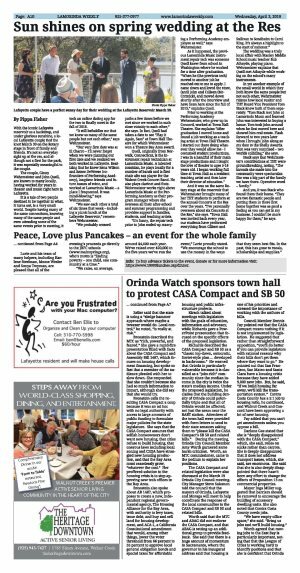 The CASA Compact and related legislation were also discussed at the March 19 Orinda City Council meeting. City Manager Steve Salomon told the council that the mayors of Orinda, Lafayette and Moraga will meet to help coordinate the response of the local communities to the CASA Compact and SB 50 and related bills. Worth said that the MTC and ABAG did not endorse the CASA Compact, and that ABAG is setting up an additional group to provide feedback. She said that there is a huge amount of momentum in Sacramento, where the governor in his inaugural address said that housing is one of his priorities and stressed the importance of working with the authors of bills. Council Member Dennis Fay pointed out that the CASA Compact means nothing if it is not implemented by legislation. He suggested that rather than straightforward opposition, "you'll do better if you can provide legislators with rational reasons why their bills don't get them where they want to go." He pointed out that San Francisco, San Mateo and Santa Clara have a housing crisis because they have added 9,000 new jobs. But, he said, "if we build housing far away, we'll kill the transportation system." Contra Costa County has a 5:1 job to housing ratio, he continued, and Walnut Creek and Concord have been approving a lot of new housing. Fay added that you can't get amendments unless you oppose a bill. Darlene Gee stated that she is "deeply disappointed with the CASA Compact," which, she said, relies on sticks rather than carrots. She is deeply disappointed that it does not address transport issues, which, she said, are enormous. She said that she is also deeply disappointed that there hasn't been any effort to change the effects of Proposition 13 on commercial properties. Mayor Inga Miller suggested that barriers should be removed to encourage the building of accessory dwelling units. She also noted that Contra Costa County needs jobs. "We have empty office space," she said. "Bring us jobs and we'll build housing." Worth agreed that moving jobs to the East Bay is particularly important, noting that that the League of Cities is working hard to identify positions and that she is confident that Orinda staff can identify Orinda's concerns. Staff can prepare a letter for the mayor's signature.